Admission is FREE... reserve your tickets now. Additional Tickets will be made available at the box office one hour prior to each performance. Only once in 58 years have we been unable to accomodate every request. A seat will be reserved for each ticket requested. Please only request the number of seats you know you will use. Tickets may only be requested for one performance for each name, email or mailing address submitted. If you wish to attend multiple performances please view our Same Day Seating information. The DOROTHY SHAW BELL CHOIR and the F. Howard Walsh family hope that you enjoy this year's presentation of The Littlest Wiseman. We welcome you to this "place" of Christmas. There are some considerations that we ask of you as guests in the "gift of sharing." * Children under 4 years of age will not be admitted. * You must be in your seat 10 minutes before curtain time. Seats not occupied at that time will be given to those waiting. No one will be seated after the play begins. * Please allow extra time for parking. There are other events scheduled in the facilities that share the parking lot with the W. E. Scott Theatre. Additional seats are available at every performance even if you do not have tickets! These tickets become available one hour before the performance at the W. E. Scott Theatre box office. Even if reservations are full, we highly encourage ticket requests at the door. Only once have we been unable to seat every person in our history of greater than 400 performances. If you have additional questions, please contact tickets@thelittlestwiseman.org or call 817-924-3640. 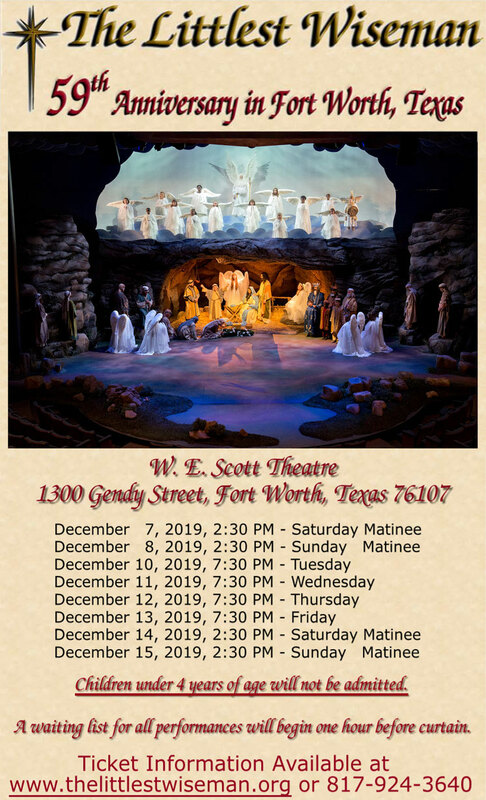 Or, if the performance date is too close to mail them, please return your tickets by emailing or calling: tickets@thelittlestwiseman.org / 817.924.3640.